A City University London academic says he is "thrilled" after an album made by his vocal ensemble rose to No. 1 in an Amazon chart. Good Friday in Jerusalem, conducted and researched by Dr Alexander Lingas, quickly rose up the website's rankings after being released on Tuesday 10th February. In the charts for new releases, the album hit No. 1 on the Opera and Vocal list on the day after its release and made it to No. 2 in the Classical list. Dr Lingas, a Reader in Music and BMus Programme Director, also sang on the recording of medieval Byzantine chants alongside his group Cappella Romana. 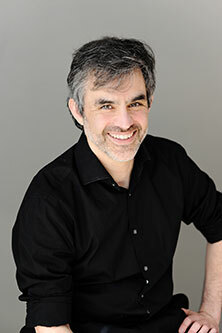 The release, which features interpretations of music from the eighth and ninth centuries, was produced by GRAMMY-winning producer Steve Barnett. Dr Lingas said: "Having just returned from the USA where the CD was launched with live performances of this programme of Byzantine chant from medieval Jerusalem, I am thrilled to see our work at bringing this music to life having such an immediate impact." 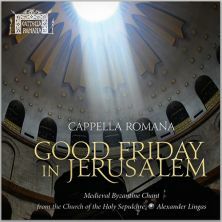 Good Friday in Jerusalem was recorded at Memorial Church at Stanford University, where Cappella Romana was in residence for a week in February 2013 as part of the Icons of Sound research project. The ensemble, which consists of performers from Greece, the UK and the US, also recently performed at Trinity Wall Street in New York as part of the Twelfth Night Festival. For more information, visit the group's website. Cappella Romana is a professional vocal ensemble that performs early and contemporary sacred classical music in the Christian traditions of East and West. The ensemble is known especially for its presentations and recordings of medieval Byzantine chant (the Eastern sibling of Gregorian chant), Greek and Russian Orthodox choral works, and other sacred music that expresses the historic traditions of a unified Christian inheritance.